Steve Robinson won the Eastern Cross-Country Championships at Bury St Edmunds. 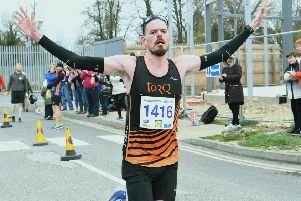 An eleventh hour decision to run proved the right choice for Peterborough AC’s Steve Robinson as he ran out an easy winner of the Eastern Cross-Country Championships on Saturday. Robinson had been fighting a heavy cold all week and as late as 8am on race morning he thought he wouldn’t run. Peterborough Athletic Club's team at the Eastern Cross-Country Championships. From the left they are Nick Stone, Steve Hall, Steve Robinson, James Skinner, Ollie Mason, Nathan Popple, James Sadlier and Shaun Walton. But a change of heart - and the realisation that possibly PAC could defend the team title - saw the RAF man toe the line. “I felt much better after breakfast,” the PAC distance man said. And it showed very quickly in the race as he wasted no time in surging to the front in the opening mile. “It was a fast course, so I knew I had to get going straight away to make sure track speed athletes weren’t close in the final part,” added Robinson. This championships, one of the most traditional on the calendar, is very much a team event and last year PAC won it for the first time in the 100 years it has been taking place. “We thought we’d be close to doing it again,” said Robinson. It was close, but on this occasion the six scorers had to make do with silver. Shaun Walton was fourth, with a much needed and impressive sprint finish in one of his best runs ever, so that was two in for PAC. James Skinner was also in amazing form despite suffering from a chesty cough as he finished 13th - brilliant for a 40-year-old at this level. Nick Stone, making a welcome return to running after a few years out, was 16th, then came veteran Steve Hall in 33rd and finally James Sadlier closed in the team in 44th place. It was close but local side Ipswich Jaffa had closed their six counters into the top 22. Backing up the team was Nathan Popple in 49th and Oliver Mason in 51st place. Ellen Ellard was a bronze medallist in the Under 20 age group, yet another medal for the King’s School athlete, while in the Under 17 boys race Jacob Fox improved enormously to finish a competitive 10th, Patrick Szpryngiel was 14th and Lewis Turner 16th to bring PAC home in fourth. Aidan Painter was 19th. In the Under 13 boys race, Oliver Beesley had a solid run as he finished a very creditable 13th to cap a good day for PAC.